Yamaha’s Broc Parkes took the first World Supersport victory of the season in Qatar in the most dramatic of fashions. It looked as if Fabien Foret was certain of the win as he held off strong competition from Parkes and Joan Lascorz. But the Frenchman ran out of fuel with just a few corners to go. And there was drama also from the British riders with Jonathan Rea crashing out early on and Chris Walker recording a top 10 finish. But the British celebrations will be wild in the paddock as Craig Jones claimed the final podium spot. Britain’s Jonathan Rea, riding with a damaged ankle after his crash yesterday, got a strong start on his Hannspree Ten Kate Honda to take third but it was Craig Jones who put his Honda CBR600RR in to the lead mid way through the first lap. Joan Lascorz took the lead from Jones but the Brit wasn’t giving up and battled hard while Rea had put himself through for second. Chris Walker was in 13th at the end of lap one on his Kawasaki ZX-6R. And the Hannspree Ten Kate Honda team suffered a nightmare on the second lap. 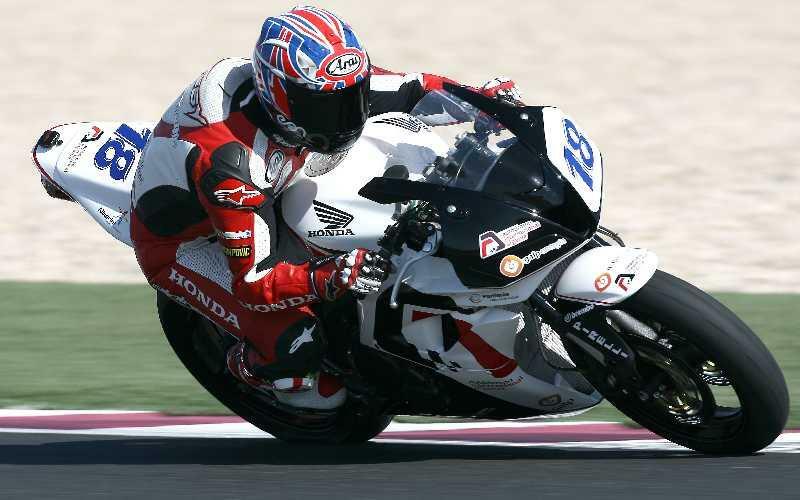 Former British Superbike star Jonathan Rea high-sided and team-mate Andrew Pitt got caught up and rode straight in to Rea’s flailing CBR600RR and also crashed out. Back out front on lap four Fabien Foret was building up a lead ahead of Broc Parkes and Craig Jones. British rookies Graeme Gowland and Chris Walker were in ninth and 11th respectively. Foret’s lead was 1.365secs on lap six. Graeme Gowland was back down to 10th while Chris Walker had slipped down to 13th. Marc Aitchison, in his first World Supersport crashed out of the race. Foret’s lead had dropped to just a second by the end of lap seven while Walker was in 10th. Veteran Aussie Gary McCoy retired from the race on lap nine. Craig Jones found himself under pressure heading in to the second half of the race and lost his third place to Joan Lascorz on lap 11. Foret was 2.279secs ahead of Australian Broc Parkes by lap 13, whiole Pakes was only 0.741 ahead of Glanor Motocard’s Lascorz. Kawasaki man Chris Walker managed to pull himself up to 10th in this his first World Supersport race. Luca Nedog was another faller with just two laps to go, losing his Honda CBR600RR. Lascorz went through to second with just a lap to go with Craig Jones also pushing in fourth for a podium spot. And the drama continued just a few corners from the end as race leader Fabien Foret ran out of fuel. Then Lascorz, already on a charge, went through to take the lead from Broc Parkes but right at the chequered flag got the slip stream to take the win by the slimmest of margins with Britain’s Craig Jones claiming third place. Parkes, Foret’s team-mate, also ran out of fuel on his in lap and had to get a lift in from Lascorz.